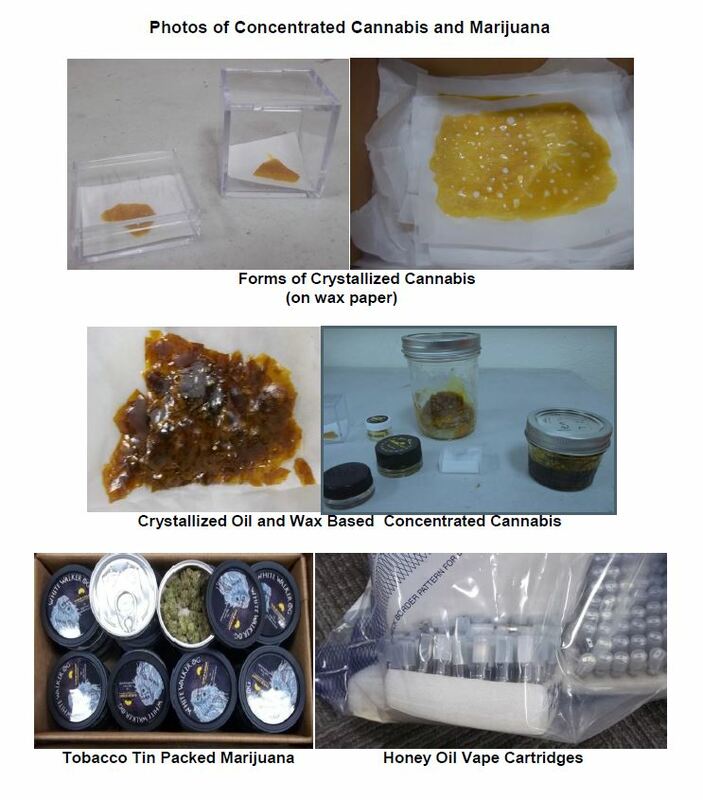 HACIENDA HEIGHTS >> El Monte police searching for a car stolen from an El Monte auto dealership discovered a marijuana oil extraction lab operating out of a Hacienda Heights home, seized $1.8 million worth of pot and concentrated cannabis, authorities said. The investigation began Monday with the theft of a Lexus LS 460 from Long Lexus, 3530 Peck Road in El Monte, El Monte police officials said in a written statement. Two days later, police got a lead on the stolen Luxury car, which is valued at more than $70,000. “The vehicle was equipped with a tracking device that was pinging in the area of the 14700 block of Horticultural Drive, Hacienda Heights,” according to the police statement. The El Monte Police Department’s Special Investigations Team and the Task Force for Regional Auto Theft Prevention responded. “Detectives identified 14720 Horticultural Drive as the property where the vehicle was suspected of being concealed out of view,” the statement said. A man at the home spoke to detectives through a security gate and denied police permission to search the property for the stolen Lexus. Police surrounded the home and obtained a search warrant, officials said. Officers arrived at the home, search warrant in-hand, about 6 p.m. Tuesday, El Monte police Sgt. Richard Luna said. Due to the potentially dangerous chemicals at the home, authorities evacuated the property as the The Los Angeles Interagency Metropolitan Police Apprehension Crime Task Force Narcotics Lab Team and Los Angeles County hazardous material team dismantled the lab and safely stored the evidence. “Most of the contraband was packaged for the purposes of distribution,” the police statement added. The Lexus that launched the investigation was not found at the Horticulture Drive home, Luna said. It was ultimately recovered, unoccupied, within the jurisdiction of the sheriff’s Industry Station. 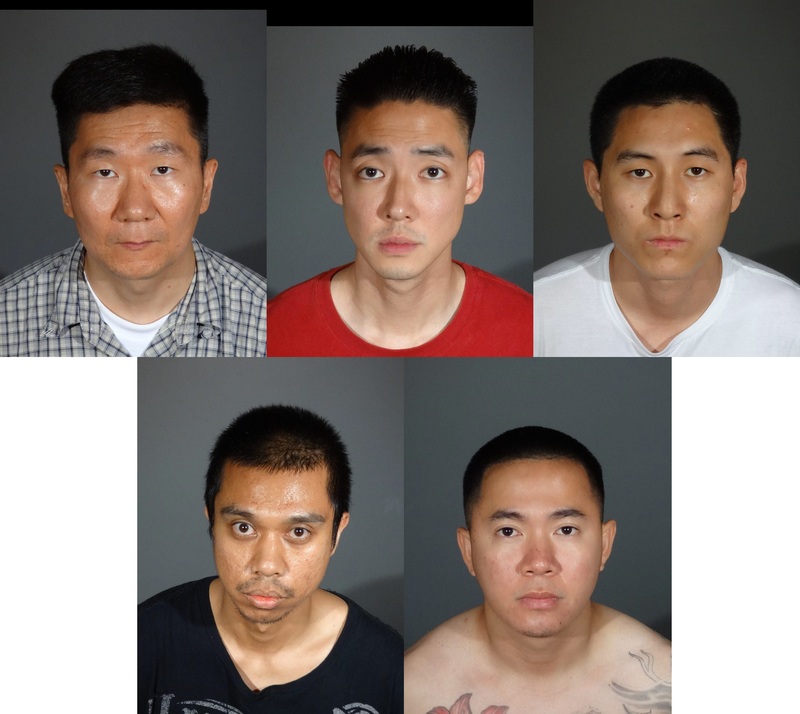 Arrested on suspicion of cultivation of a controlled substance were David Byung Kim, 38, Michael Myungkhun Choi, 31, Andrew Euyyong Kim, 26, Aaron Michael Corpuz, 28 and Francis Azle Ocampo, 28. All five suspects were released from custody on Wednesday pending their initial court appearances after posting $75,000 bail each, records show. Anyone with information is asked to contact El Monte police at 626-580-2100, or email tips@empd.org. Tips may also be submitted anonymously to L.A. Regional Crime Stoppers at 800-222-8477. HACIENDA HEIGHTS >> A 21-year-old Covina man died early Saturday when he was struck by a car on the 60 Freeway in Hacienda Heights after exiting his car following a previous minor collision, officials said. Aaron Joseph Sandoval died at the scene of the crash, Los Angeles County Department of Medical Examiner-Coroner Investigator Joyce Kato said. The crash was first reported about 3:05 a.m. on the 60 Freeway at 7th Avenue, California Highway Patrol Officer C. Black said in a written statement. Black said Sandoval was driving eastbound on the freeway in a 2004 Honda Civic and been involved in a collision with a Toyota Prius. He got out of his car, which was stopped between the carpool and fast lanes. An eastbound 1990 Honda Accord being driven by an 18-year-old Joshua Tree man struck the pedestrian, Black said. The Accord then careened into a 2015 Dodge Challenger that was stopped in the carpool lane. The impact threw Sandoval over the center divider and into the carpool lane of the westbound side of the 60 Freeway, according to the CHP. Paramedics pronounced him dead at the scene. A woman riding as a passenger in the Dodge suffered major injuries, Black said. The man at the wheel of the Dodge and a teenage boy riding as a passenger were treated for injuries described as moderate. No injuries were reported on the part of the Accord driver. No arrests were made Saturday morning. A Sig Alert affected lanes on both sides of the freeway through 8:50 a.m., according to CHP logs. The crash remains under investigation by the CHP’s Santa Fe Springs-area office. Any witnesses, or anyone with information, can reach the office at 562-868-0503. HACIENDA HEIGHTS >> A Maywood man died in pickup truck crash early Saturday after one of the truck’s tired blew out on the 60 Freeway in Hacienda Heights, officials said. Officials withheld the identity of the victim pending notification of family, Los Angeles County Department of Medical Examiner-Coroner Lt. David Smith said. California Highway Patrol officials described him as a 49-year-old Maywood man. The crash took place at 5:10 p.m. on the eastbound 60 Freeway, just west of Hacienda Boulevard, CHP Officer M. Iniguez said in a written statement. The 1995 Ford Ranger was traveling in the carpool, No. 1 or No. 2 lanes when a tire blew out, according to the officer. The upside-down pickup truck slid on its roof across the shoulder and ended up striking a metal guardrail lining the Hacienda Boulevard onramp to the eastbound 60 Freeway. The driver and lone occupant of the truck died from his injuries, Iniguez said. Anyone with information is urged to contact Officer Iniguez at the CHP’s Santa Fe Springs-area office at 562-868-0503. HACIENDA HEIGHTS >> A man is expected to survive after he was shot in a residential neighborhood in Hacienda Heights late Wednesday, officials said. Deputies responded to reports of “shots fired” about 11 p.m. along Three Palms Street, west of Hacienda Boulevard, Los Angeles County sheriff’s Sgt. James Beamon said. They soon found a victim, described only as a man, suffering from a gunshot wound, the sergeant said. He was taken to a hospital with injuries not believed to be life-threatening. 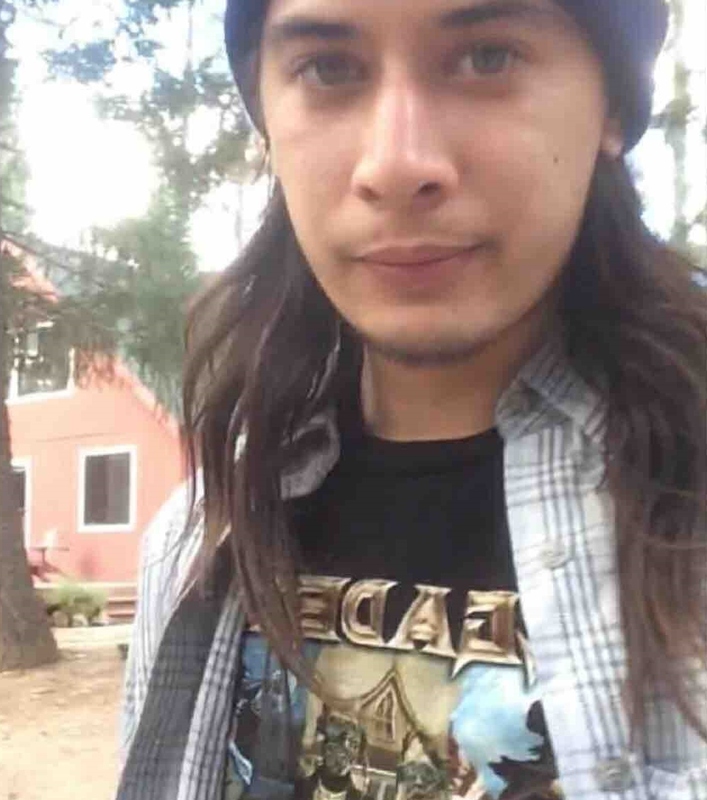 HACIENDA HEIGHTS >> A judge sentenced a man to probation and community service Wednesday for causing a crash that killed two 18-year-old high school sweethearts in their hometown of Hacienda Heights, officials said. Key Jaison Kim, 69, pleaded “no contest” to two misdemeanor charges of vehicular manslaughter in connection with the Oct. 18, 2015, crash at the 7th Street offramp of the eastbound 60 Freeway, according to Los Angeles County District Attorney’s Office spokeswoman Sarah Ardalani. California Highway Patrol officials described Kim as a Hacienda Heights resident. Wednesday’s court proceeding in the El Monte branch of Los Angeles County Superior Court was an “open plea,” Ardalani said in a written statement. The prosecution did not negotiate a sentence with the defense before Kim entered his “no contest” plea. In addition to five years of summary probation, “Los Angeles County Superior Court Judge Donna Hollingsworth also ordered the defendant to complete 800 hours of community service, attend the hospital and morgue program and complete the Mothers Against Drunk Driving Victim Impact Program.,” Ardalani said. Furthermore, Kim’s driver’s license was revoked for five years. Kim was exiting the freeway about 7 p.m. when he lost control of his Lexus sedan, which flew off the side of the onramp and smashed into the Toyota Tacoma pickup truck which Steward was driving on 7th Avenue, with Castillo riding as a passenger. The top of the truck was sheared off by the impact. Paramedics pronounced Steward and Castillo dead at the scene. Kim was driving at “an extremely high rate of speed” and failed to stop at a stop sign just before the crash, California Highway Patrol officials said shortly after the crash. Driving under the influence was not alleged. “According to the prosecutor, the defendant committed pedal error by applying pressure on the accelerator pedal instead of the brakes while exiting the offramp.” Ardalani said. Following a lengthy investigation by the CHP, Kim was charged with two counts of manslaughter in August of 2016, nearly 10 months after the deadly collision. Loved ones said the young couple had a promising future. Steward had been studying and playing football at Mt. SAC in Walnut, and Castillo was studying at Citrus College in Glendora. HACIENDA HEIGHTS >> A La Puente man who lived as a fugitive in Mexico for three years before his capture is guilty of murdering his girlfriend in 2011 and dumping her body in Hacienda Heights, a jury found Friday. A jury at the Pomona branch of Los Angeles County Superior Court deliberated for less than a day before convicting Francisco Nila Rojas of first-degree murder for the Feb. 18, 2011, slaying of 41-year-old Claudia Tecuautzin of La Puente, Los Angeles County District Attorney’s officials said. The jury also found true the special allegation that Rojas personally used a gun. He faces up to 50 year to life in state prison at his sentencing, scheduled Monday, district attorney’s office spokeswoman Sarah Ardalani said in a written statement. After shooting Tecuautzin in the head, he dumped her body down an embankment along Turnbull Canyon, near Skyline Drive, Los Angeles County sheriff’s and coroner’s officials said. A passer-by discovered her remains on March 2, 2011. It took coroner’s investigators several weeks to identify the body, due to the condition in which it was found. “According to evidence presented at trial, Rojas stole money from Tecuautzin’s bank accounts before and after she was killed,” according to Ardalani. But by the time the victim and suspect had been identified, the killer had fled the country. Rojas, a Mexican national, fled to Mexico five days after the killing, according to Lt. John Corina of the Los Angeles County sheriff’s Homicide Bureau. He was captured in Mexico in 2014, then extradited back to Los Angeles County to face trial in October of 2015. HACIENDA HEIGHTS >> A gunman robbed and kidnapped pizza delivery driver late Tuesday, deputies said. The crime unfolded just after 7:15 p.m. after the delivery man dropped off an order in the 1500 block of Fieldgate Avenue, Los Angeles County sheriff’s Lt. David Infante said. A man approached the driver while brandishing a black, semi-automatic handgun, the lieutenant said. He demanded the delivery man’s money, obtaining about $75, he said. He then ordered the delivery driver to give him a ride. The gunman fled on foot after being driven to the area of Gale and Farmstead avenues in neighboring Industry, Infante said. He was described as a Latino man between 22 and 25 years old, about 5 feet 4 inches to 5 feet 5 inches tall, 140 to 150 pounds, with a shaved head. HACIENDA HEIGHTS >> Authorities have identified a 60-year-old Hacienda Heights man fatally shot by deputies after allegedly confronting them with a gun outside his home late Thursday. Robert James Hess died at the scene of the deputy-involved shooting, which took place about 10:50 p.m. in the 15600 block of Windrush Drive, Los Angeles County Department of Medical Examiner-Coroner Lt. David Smith said. He was first approached by police in Downey about 1 p.m. who responded to reports he was armed with a knife and a gun and had threatened to kill family members, according to Deputy Trina Schrader of the Los Angeles County sheriff’s Information Bureau. Hess fled from police on a motorcycle and eluded pursuing officers on the 5 Freeway, she said. Downey police went to Hess’s home in Hacienda Heights and set up a stake-out to wait for the suspect, authorities said. Los Angeles County sheriff’s deputy were summoned to assist when Hess was spotted walking up the street Thursday night. Deputies used less-lethal weapons to try, unsuccessfully, to subdue Hess as he reached for a handgun in his pocket, Schrader said. He grabbed the gun and deputies opened fire, mortally wounding him. No deputies were injured, officials said. A handgun was recovered from the scene. Anyone with information can reach the sheriff’s Homicide Bureau at 323-890-5500. Tips also may be submitted anonymously to L.A. Regional Crime Stoppers at 800-222-8477.